When Stray Dog’s Artistic Director and co-director of “Urinetown- The Musical,” Gary F. Bell, walked on stage for the pre-curtain speech on opening night, he mentioned he was wearing his Bertolt Brecht outfit- all black. Since this musical satire leans heavily on Brechtian influences, it was more than appropriate. What Mr. Bell really should have done is don Groucho Marx glasses and moustache as well. In this zany interpretation of a show that’s already way out on a comedy limb, slapstick and outrageous sight gags prevail. Oddly enough, it all works. Not unlike “Godspell,” “Urinetown” can stand a wide range of “schtick” and modern updates. After all- like stores from the Gospels- corporate greed, revolution and heroes are always in fashion. But “Urinetown” doesn’t stop with a nod to “Godspell-” we’re treated to take-offs on other musicals like “Les Miz,” “West Side Story” and even more obscure references throughout the evening. Mark Hollmann’s music, the witty Greg Kotis book and lyrics by both make this one of the funniest revolutions you’ll ever see- on stage or anywhere. And keeping with the tradition they started earlier with a wonderful production of “The Who’s Tommy,” Stray Dog puts quality on stage from actors to direction and choreography and even the wild, miscellaneous junk that turns into a brilliant set design. The aforementioned Gary F. Bell and the creative Justin Been have combined to bring every “nuance” of this story to the stage. Each actor has a distinct character- from the leads to the chorus of downtrodden citizens who are forced to pay to use the toilets- have individual idiosyncrasies that they maintain throughout the play. Choreographer J.T. Ricroft has maintained that Marx Brothers style in the musical numbers and Justin Barisonek’s inventive set is complemented with the distinct Tyler Duenow lights and the perfect costume design by Alexandra Scibetta Quigley. Antonio Rodriguez brings his delightful singing voice and marvelous acting skills into play with a winning interpretation of our young hero, Bobby Strong. Blowing us away with her comedic timing and physical bits, such as dancing while tied to a chair, is Jennifer M. Theby as our young heroine, Hope. I hope she’s remembered next year when the Kevin Kline’s come around. Keith Thompson also shines as our narrator for the evening, Officer Lockstock. In another great comedic touch, he constantly reminds us that we’re watching a musical and then informs us that this particular piece of business or another is typical of musical comedy- even to the point of announcing that we’re about to see the Act One finale and “releasing” us for intermission. Berklea Going is delightful as little Sally- who is the lynchpin tying the tyrants and the revolutionaries together and choreographer J.T. Ricroft doubles up as the hilarious Mr. McQueen who tends to have toupee issues throughout the show. Christopher R. Brenner scores as the corporate monster behind the pay-as-you-pee scam and the mythical Urinetown. Deborah Sharn wows us with her strong arm tactics and powerful singing voice as Penelope Pennywise. Michael Brightman as a corrupt senator, Josh Douglas as Officer Barrel (get it, “Lockstock” and “Barrel?”), Lindsey Jones as our hero’s mother and Jessica Tilghman as a silent but effective secretary round out the major cast. However, the singing and dancing chorus stand out in multiple roles- most notably as the beleaguered citizens. They include Ryan Cooper, C.E. Fifer, Sabra Sellers, Anna Skidis and Jeffrey M. Wright. 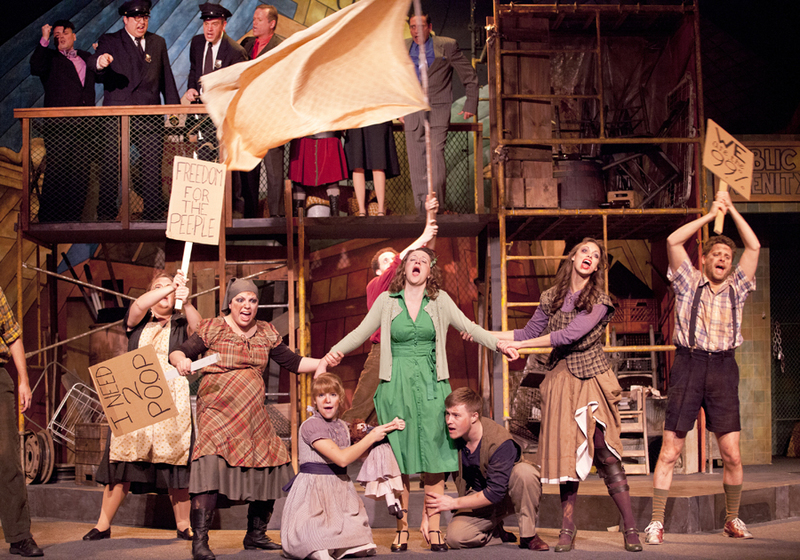 Just as “Tommy” became the must-see musical last year, Stray Dog’s “Urinetown-the Musical” has become a big hit for this half of their winter season. Tickets are becoming scarce, so call them now at 314-865-1995 or visit them online at http://www.StrayDogTheatre.org. 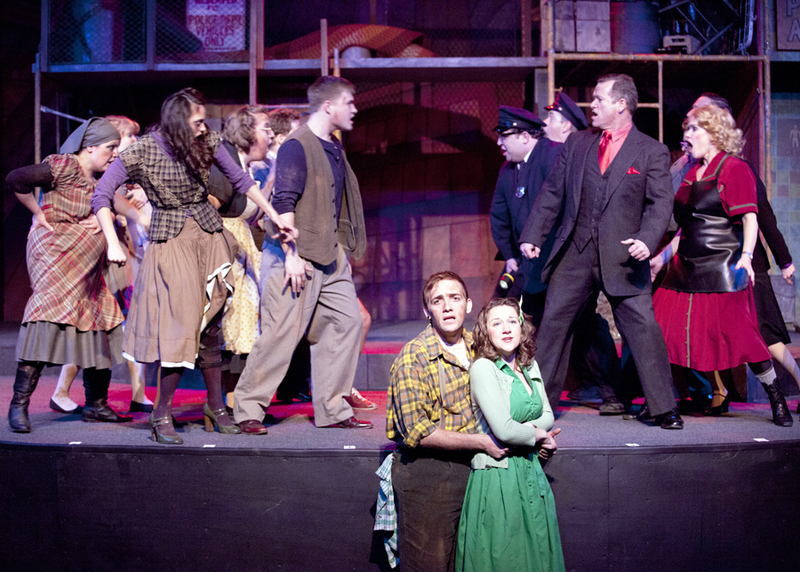 Whatever you do, don’t miss Stray Dog’s “Urinetown-the Musical” playing through February 18th. This entry was posted on February 4, 2012 at 9:43 pm02 and is filed under Uncategorized. You can follow any responses to this entry through the RSS 2.0 feed. You can leave a response, or trackback from your own site.